In the Summer of 1997 we moved to Kelowna from Vancouver with our two pre-school children after looking for a community to raise our family and grow our Kelowna real estate business. We chose Kelowna for the same reasons many others have and haven’t had any regrets. The community atmosphere in Kelowna has offered us many opportunities that larger urban centres don’t. Jo-Ann and I have also lived in Montreal, Toronto, Norway, England and the United States. The things I like best about living in Kelowna are the quick access to the mountains and the fresh clean water of Okanagan Lake. In the past 17 years Kelowna has changed a lot but it is still a fantastic place to go biking, boating or running and Kelowna holds the annual Apple triathlon every August. We’ve embraced the “beach town culture” and enjoy walking to the lake every hot day even if it’s for a half hour or so to just read a book or say hi to our neighbours. Commuting is easy in Kelowna and most of us get around by car and with our International Airport direct flights are offered to Toronto, Los Angeles, Germany and Mexico in addition to about a dozen or so flights to popular destinations like Vancouver, Seattle and Calgary. I’m able to ride my bike around town safely with the well-connected and dedicated bike lane system. What is the most important thing a person or family relocating to Kelowna should know? The most important things a family should know about moving to Kelowna is that the neighbourhoods should fit their needs. We are located on a 90 mile fresh water lake which curves and changes direction in Kelowna so the sunlight and vegetation is different in the areas. Each of the areas in Kelowna and West Kelowna are wonderful for very different reasons, if you can decide what your 3 top priorities are and the price range you are looking for we would love to help you. 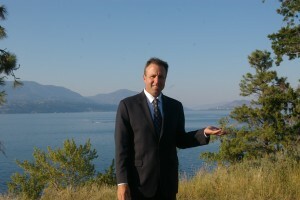 For me the best part of Kelowna Real Estate is meeting people and helping them find the perfect home for them. For some, it’s important to be near a good school with friendly neighbours. Others want to be in a downtown setting where “all the action” giving up a backyard. I’ve learned that everyone is unique. When someone says “I want to live within a short commute to downtown (or the hospital, university, airport etc. )” it might mean no longer than 10 minutes in a car. On the other hand, others are thrilled that it’s only a 45 minute drive to the airport from Glenrosa. My top 5 recommendations for Kelowna home buyers are…. Engage a mortgage broker or your bank for a pre approval. This is a no-brainer and saves so much time knowing your price range from the get-go. Nothing worse than finding the perfect $575,000 home only to find out you are only able to spend $525,000. Work with one Realtor. We have access to all the new listings on the MLS listed by all Real Estate Companies in Kelowna. Choose a Realtor you feel good working with and stick with him or her. Decide what the “Must Haves” are in a home. A suite? 2 master bedrooms? Swimming pool? Air conditioning? Usually compromises will have to be made but going about the home search logically makes it easier to rule out many homes from the outset. When you decide on a home ask your Realtor for comparable homes that have sold in the area so you can make an educated decision on the price to offer. So many times home buyers just look at other homes for sale instead of finding out others that have sold. When you make an offer to purchase request a home inspection, even (especially) if it’s a new home. Also, go with your Realtor to city hall to find out about any sewer levies, outstanding permits or any other plans developers may have for your neighbourhood. Part of Andrew’s team is his wife Jo Ann McLellan who manages the marketing and customer care while his son Emmet films and edits the videos. A couple of things about Andrew Smith Royal LePage Kelowna Andy is a regular competitor in local marathons and triathlons. He competed in the Penticton 2006 & 2008 Ironman Canada. Past Finance Chair of the Kelowna Catholic Independent School Council.